The location of the newly renovated FOG CITY restaurant is steeped in history — one that goes back way beyond the 1985 opening of the original Fog City Diner. From feeding hungry sailors before they shipped out to serve in WWII to housing a railroad building servicing trains in San Francisco’s first railways, and acting as a docking point for ships during the Gold Rush, this site has always been an integral part of the rich tapestry of San Francisco history. With its newly renovated space, the latest incarnation of FOG CITY looks forward to adding another exciting chapter to the history of 1300 Battery Street. Located along the Embarcadero, FOG CITY is a beautiful and historic destination for modern, eclectic San Franciscan cuisine and cocktails. 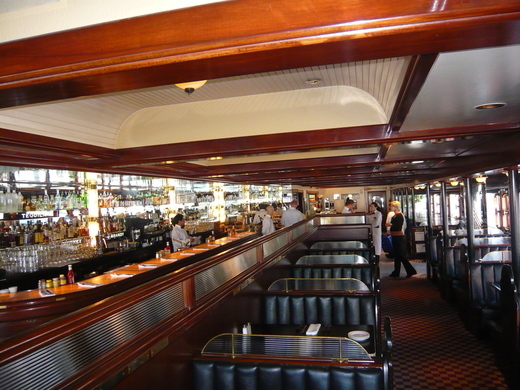 The original Fog City Diner, which opened in 1985 and closed for renovations in March 2013, has been completely re-imagined by renowned Chef Bruce Hill and its founders, Bill Higgins, and Bill Upson. Maintaining the energy and approachable spirit of the beloved original, FOG CITY offers innovative menus in a sophisticated, warm and open space created by Bay Area architect Michael Guthrie.